Do you collect little sayings, words of wisdom or verses for your sewing projects? I know I do. I have a little book that I write them in. When I need some meaningful words for a quilt label or as a feature verse for a stitchery or quilt, I turn to my little book with confidence. Here are a few quilt sayings that I thought you might enjoy. Putting it together, that’s what counts. Blessed are the children of the piecemakers for they shall inherit the quilts. Friends are like fabric - you can never have too much. Quilters affect eternity: they can never tell where their influence stops. 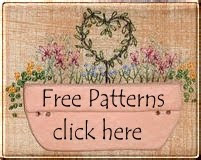 Click here for lots of other quilt sayings that I know you will enjoy.